A nerve in this scenario has not gone through an acute stage but has slowly broken down and died (become necrotic). It typically is irritated occasionally with eating or tapping on the tooth. However at other times there is no discomfort. The tooth may have had a deep filling a while ago or had several fillings over time. The dead tissue slowly irritates the bone just outside the end of the root. 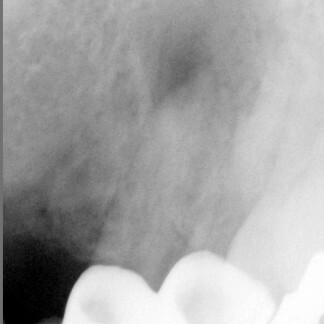 Usually this is seen on an xray as a circular shadow around the end of the root. To determine if a nerve has died a test using an extreme cold spray at -50 degrees can be used. 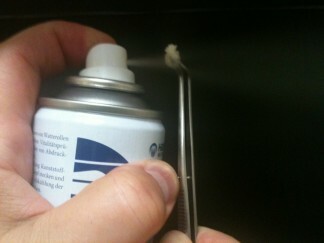 The spray is directed onto a small cotton ball then placed on to the tooth surface. A tooth that is alive will feel cold quickly and then, once the cold is off it, the sensations stops straight away. The dead tooth feels no cold at all. Tapping on the tooth can also produce discomfort. A crack tooth can have similar sensations to discomfort on eating and tapping on it, however, a cold test usually is more sensitive and can linger. The ultimate test is to remove any old filling to look underneath for decay or cracks. Sometimes to be certain that the tooth has died the procedure is done without anesthetic. DON’T TRY THIS AT HOME! The dentist does have to be an “oral sherlock holmes” as pain can be referred. For example, if a tooth nearby has had a history of pain, the brain may believe it could be the same tooth. Sometimes the bone could be dense at the area at the end of the root, so to obscure the “circular shadow” of infection in the bone. If the dentist is uncertain then DO NO HARM. Good note keeping can lead to identifying a pattern that could help with the diagnosis in the future.